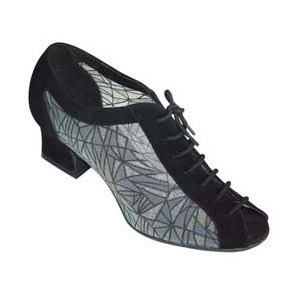 Black Nubuck with Silver Pattern Mesh Lace up peep toe with suede sole. UK sizes 2-9 inc half sizes. Available with a 1.6" cuban heel. 1.8" & 2.2" cuban heels and wide fittings can be made to order and take approximately 4 weeks to manufacture.